This entry was posted in Ice Island, Oceanography and tagged continental shelves, earth rotation, Labrador, NASA, oceanography, Petermann. Bookmark the permalink. So given the water depths in this area what is your prediction? 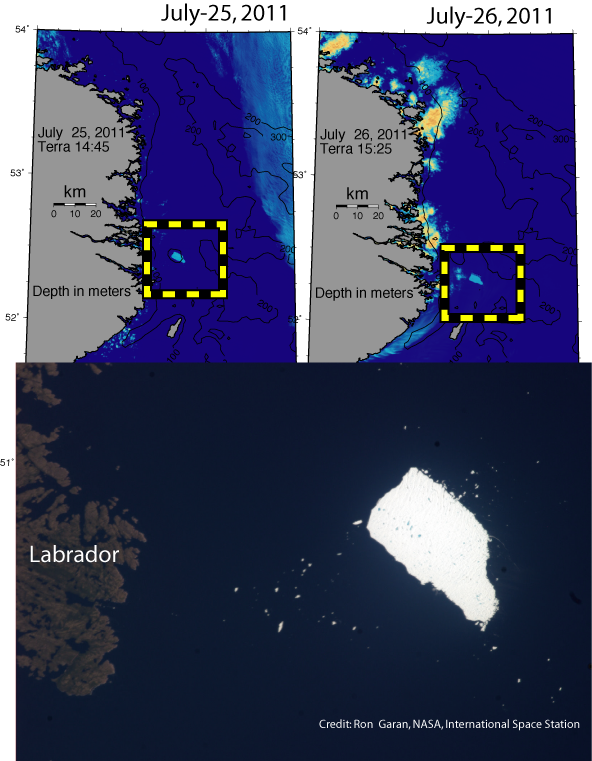 The ice island will stay to the east of Newfoundland, make to the latitude of St. Johns and the rich fishery grounds of the Grand Banks which also sees a fair bit of oil production inshore of the 1000 meter isobath. I will have to down-load and plot the bathymetric data, but a quick google-search revealed a beautiful map from Shaw (2006) who describes how this shelf evolved over the last many thousands of years that includes the last ice age. I am unsure about copyright issues as this is a Canadian Government publication, but the images are so vivid, that I post them here anyway and let Dr. Shaw know. More to read, more to learn, too much fun. This entire area has very good historical data coverage as the livelihood of Newfoundland is tied closely to these two offshore industries. Her Majesty the Queen holds the copyright of the published imagery and work of Dr. Shaw. He also pointed me to Canadian Government sites on the glacial history of Newfoundland and the ocean around it as well as its implication on sea level change. Thank you so much for new learning, Dr. Shaw. One interesting aspect is the tabular nature of this iceberg. Most Greenland icebergs are not tabular. This berg also has a shallower draft and hence less freeboard than most as well. This should lead to a bit different behavior.